What is a King Tide? The king tide is the highest predicted high tide of the year at a coastal location. It is above the highest water level reached at high tide on an average day. King tides are also known as perigean spring tides. When is a King Tide? 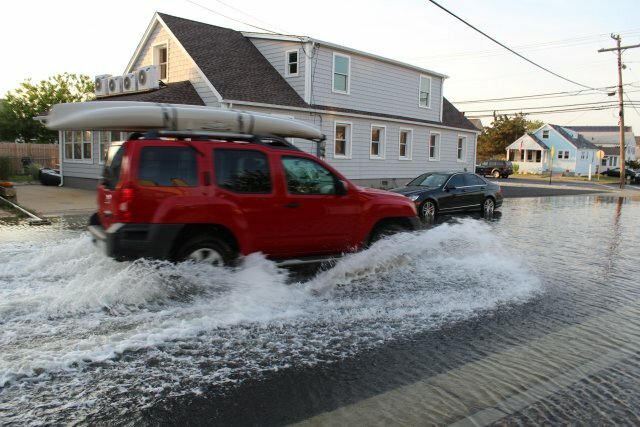 King tides are a normal occurrence once or twice every year in coastal areas. In the United States, they are predicted by the National Oceanic and Atmospheric Administration (NOAA). Learn more about tides from NOAA by using their Tides and Currents map. The Tides and Currents station map can be used to locate stations that provide water levels, meteorological observations, and current observations. NOAA also has resources to help find information about tides in your area. Find out when Atlantic and Gulf of Mexico king tides will arrive and how high they will be. What Makes King Tides Predictable? King tides occur when the orbits and alignment of the Earth, moon, and sun combine to produce the greatest tidal effects of the year. See a story map from NOAA's Office for Coastal Management and The King Tides Project to learn about sea level rise and tidal flooding. King tides flood Manasquan, New Jersey, 2013. What do King Tides Show? King tides bring unusually high water levels, and they can cause local tidal flooding. Over time, sea level rise is raising the height of tidal systems. Average daily water levels are rising along with the oceans. As a result, high tides are reaching higher and extending further inland than in the past. King tides preview how sea level rise will affect coastal places. As time goes by, the water level reached now during a king tide will be the water level reached at high tide on an average day. Delaware Sea Grant took a time-lapse video over the course of three days in October 2011 to demonstrate the flooding that can occur during a king tide. King tides provide a glimpse of future everyday water levels, and they are a way to communicate local sea level rise impacts over long time periods. Low-lying shoreline development is at increased risk of flooding because of rising seas, and public investments in infrastructure, housing, and habitat restoration projects are often expected to last for decades. Highlighting king tides in a community can raise awareness of potential sea level rise impacts and identify flood-prone locations. The increased understanding of how sea level rise will impact local resources is valuable information for community decision-makers. NOAA Coastal Services Center has a great animated video to demonstrate the threat to infrastructure posed by tidal flooding.